As of late, I haven't’ been focusing on closet versatility as I would like. I used to take a piece in my closet and try to make five different outfits with that one piece. This helped me see how much of a workhorse that piece was in my closet and forced me to get a little more creative. Today I wanted to bring my versatility series back into circulation and I wanted to kick it off with the Wrap Jumpsuit in VETTA’s Relaxed Capsule. So below are five different looks I created with this one piece. Some are a little more out there than others but overall I was very happy to see just how many looks I could create with this jumpsuit! This is how I would traditionally wear this piece. V-neck in the front, simple sandals for sunny strolls and a big summer hat. It’s classic and simple. I also love how the jumpsuit and hat become the main focus items. I also decided to further keep the look simple by matching the color of my bag to the cognac leather in my sandals. This is definitely more of a weekend mode look for me but could be work appropriate sans hat and a slightly dressier shoe. A tied button up is a classic and timeless look for summer. It keeps things casual and fun. It’s also one of the first combinations I think of when I want to layer in the summer. 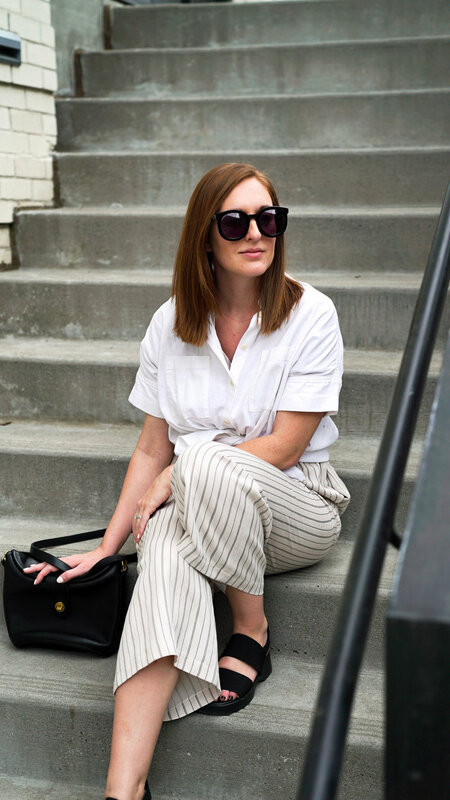 For this look I wanted to keep the colors neutral (like all of my spring outfits) so I opted for my simple white courier as the layering piece. I find that white cotton and natural linen compliment each other beautiful in the warmer months. Since this jumpsuit does have a subtle stripe pattern to it I wanted to accentuate that with black accents. I would easily wear this look to work and dress it up with cute heel sandals plus vintage black handbag for happy hour. Yes, yes I'm wearing pants over a jumpsuit. It's so easy to put an oversized top over a jumpsuit that I wanted to try a pant! Not going to lie it felt a tad weird because the rise of the pants vs. the jumpsuit were a little off but other than that it was a super comfortable look. I also believe the pants layering worked well because both bottoms were made of the same material, linen. If I had put a cotton canvas or rougher wide leg pant over the linen I think the materials would have resisted each other. I love how the wrapping detail is highlighted by the high waist pant. It just looks so clean and simple. If I find a wrap bodysuit I would have to pull the trigger. As always, I kept the colors very simple and then had a pop of "color" and texture with my round market bag. Another classic way to rework a jumpsuit. Once again I'm pairing two linen pieces together to keep a relaxed and comfortable feel. Layering looks can be super tricky as the weather gets warmer and warmer but layering with linen still allows for some air and movement. It was very hard for me to stray from pairing black pieces with this jumpsuit because I love how it accents the stripe pattern. The pattern is also not a typical stripe but made up of two different line designs making it that much more unique.